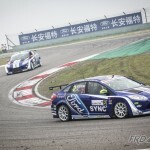 Jammer genoeg altijd vrij laat een update via het officiële kanaal van Ford in de CTCC, Race 3 werd 25 mei 2014 al gehouden. 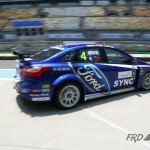 Omdat het een van de weinige Autosporten is waar de Ford Focus nog actief in is, blijven dit toch een beetje volgen. 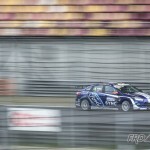 Wat ons opviel dat de looks van de Focus CTCC weer waren aangepast, wat de auto er toch weer ‘anders’ uit laat zien. En niet geheel onbelangrijk, ze hebben weer een overwinning in the Pocket, zoals je hieronder kunt lezen. 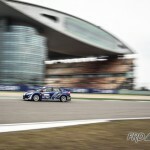 Under overcast sky, the CTCC R3 was held at 14:15 in Shanghai. 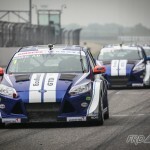 With 85kg success ballast and very conservative race setting, Martin Xie successfully finished third and gained valuable 10 points for himself and the Changan Ford Racing Team. 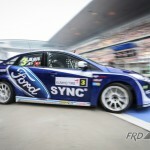 As a result of the R1 and R2 win, the four New Focus had to carry success ballast between 70kg to 85kg. Worrying about tire issues, the team elected to go with conservation settings for the race. Taking advantage of a bad start by Martin Xie, Zhang Zhendong lead the group after lap one followed by Martin Xie. Andy Yan made a good start and improved his position from fifth to third. In the meantime, Darryl O’ Young had a turbo boost hose bursted, lost power and dropped out from contention. After making contact with two Polos, Andy Yan fell to fifth. 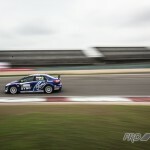 Jiang Tengyi and Wang Rui started to catch up to Martin when his tires started to lose performance. Jiang Tengyi overtook Martin but lost control of his Polos during the fight allowing Wang Rui to pass both of them. Martin and Andy crossed the finish line 3rd and 5th. 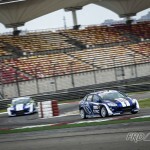 The R4 will be held at Shanghai Tianma Circuit on June 8.